Are we starting the day with a good morning to loved ones and to other people we meet on the way to our daily tasks? Do our hearts shine with God’s love in a world filled with misery vowing to make a positive difference whether big or small in our communities? Do we listen with empathy to stories of heartache and pain from those whose lives are drowning in a deluge of rain from the storms of life? Do we use soft words to confront strife...to diffuse situations always pushing toward the restoration of peace and harmony? Have the hungry been fed? Is there shelter for the homeless? Do the sick have affordable health care? 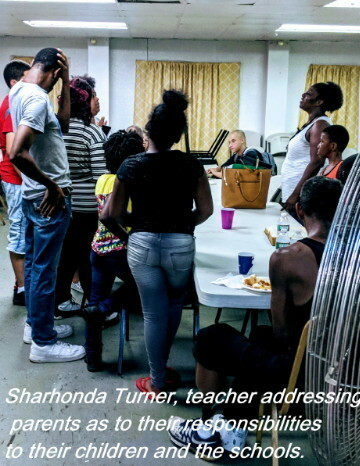 Are the incarcerated being educated to succeed in the world beyond the cement walls? Will the Statue of Liberty be allowed to continue to welcome immigrants with open arms to our country? 34) Then shall the King say unto them on his right hand. Come ye blessed of my Father inherit the kingdom prepared for you from the foundation of the world. 36) Naked and ye clothed me; I was sick and ye visited me:I was in prison and ye came unto me. “For the love of money is the root of all evil…"
only death, the grave, and hell. The holidays are drawing near and so many of us are in anticipation of the wonderful time we will have with family and friends. Yet so many others will be entering the season with hunger as their companion; fear hovering in the atmosphere in search of shelter from the winter winds; peace of mind eludes many a stressed-out soul. Where is that turkey with all the trimmings? Where are the candied yams hot from the oven steaming? Where are the pies cooling in the window with the continual flow of family and friends in and out of the kitchen? In the United States 48.8 million Americans are food insecure which means in trying to make ends meet they often do not have enough money left over for good wholesome food. Thirteen million children are hungry. One out of thirty children are homeless which translates into there being about 2.2 million children homeless in America. 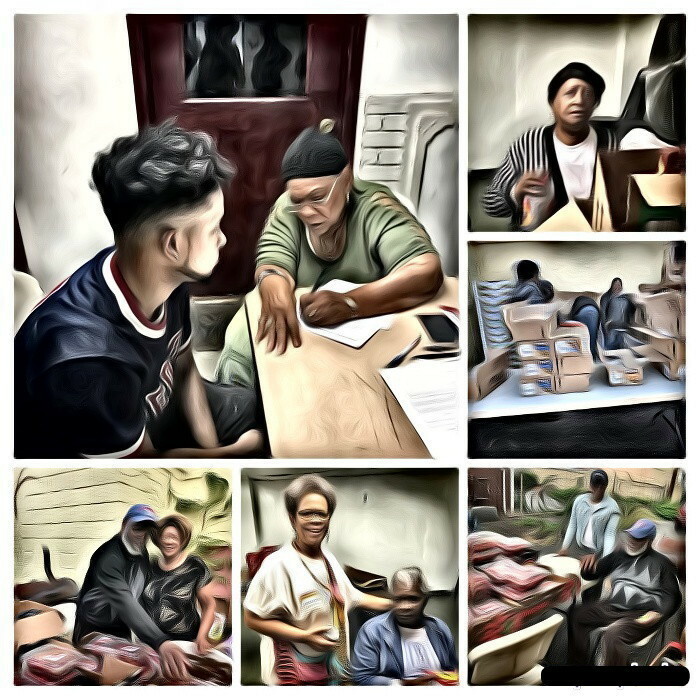 Thanksgiving and Christmas are special days out of the year where the spirit of giving is stirred up in the heart of the community yet unfortunately hunger, homelessness, and hardship are constants in the lives of those millions of Americans living at or below the poverty line. Halloween decorations…pumpkins displaying snaggle-tooth smiles sit between friendly scarecrows watching spiderweb formations trick-or-treating in and out of hunger pangs. Devastation sinks deep into despair stimulating waves of sorrow…no food tomorrow. Baby crying…children whining, “Mommy we hungry!” Multiple trips to the refrigerator divulge the same empty shelves. Lord help me…what can I do? My children need food! Halloween slides into November…the month of feasting. Turkey talk gobbles up the airways squawking about the sales of the season while a mother’s grief goes unanswered. One callous swipe of the executive pen and the affordable part of health care has been snatched from millions of Americans. There is a direct correlation between eating well, health, and education. Hungry children are at high risk for health issues and poor academic achievement as well as behavioral problems. The twins Empathy and Sympathy feed the hungry making scrumptious dinners for those in the community during the months of November and December.Their cousins, Peace and Joy, sing of an everlasting love while distributing toys to little girls and little boys; Kindness passes out coats, hats, scarves, and gloves to ward off the cold. Compassion feels good about giving back to those in need. The New Year then tolls the bell of fate and rings in hunger, homelessness, and poverty ever ready to continue their reign of terror. Pantry insanity once again...the 4th Tuesday has arrived. Early morning hustle and bustle at the food bank... gathering produce, milk products, canned goods, meat, bread, and so much more depending on the need... all this is free...free for the food bank partners helping to feed America's hungry. Lifting heavy boxes...stacking products on boats...long lines at the checkout...goods wrapped on pallets to be taken to the docks. 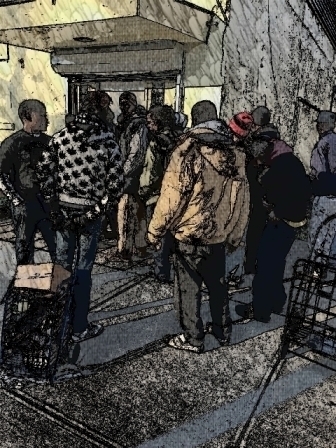 Loading the truck...next stop House of Love Soup Kitchen. It's a cold, rainy day yet people are lined up already waiting to take food home to offset their food scarcity. The food comes from several different sources. Some from large chain supermarkets, some from smaller markets, and then there are large donations from both the federal government and the state government. I recently participated in the Women's March and I know there were many concerns that were part of the platform; one of them being how nonprofit organizations and the people they serve were going to fare under the Trump administration. A few days into his administration and the decimation has begun...repeal the affordable care act...slash medicare and medicaid budgets...cut back funding to sanctuary cities...executive order to halt immigration from Muslim countries except the one's he does business with...revise the food stamp program...in other words a massive dismantling of projects that service the disadvantaged. Whose neighborhoods will this directly affect? 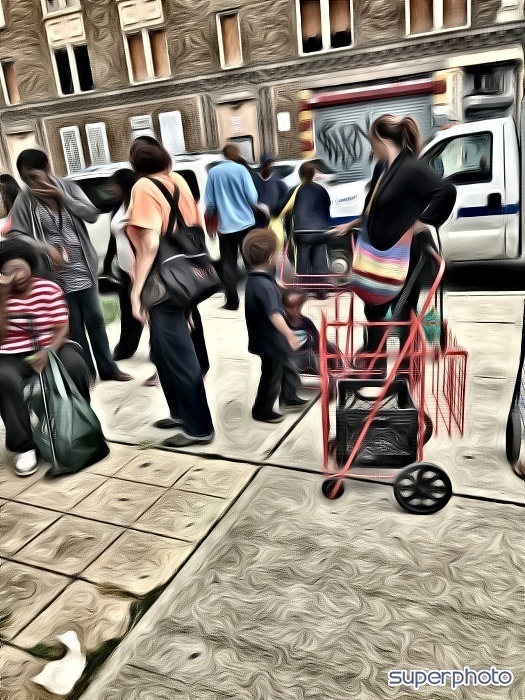 One out of seven Americans face hunger and 17% of households with children are food insecure...30% of households headed by single women...22% of black households...19% Hispanic households...9% of seniors all of whom face hunger on a daily basis. The people who go to food pantries are suppose to show ID that indicates that they are first of all residents of the state in order to receive state donations; then for the federal food donations they have to be on various assistant programs like medicaid or the food stamp program. 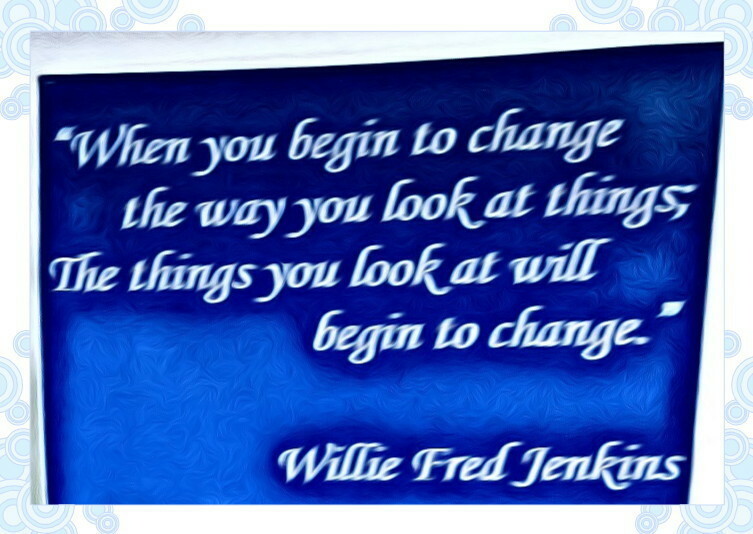 How will our clients be affected with all the tearing down of assistance programs? Large numbers of people are not only subjected to food scarcity but now have a large dark cloud of helplessness and hopelessness shrouding their futures? 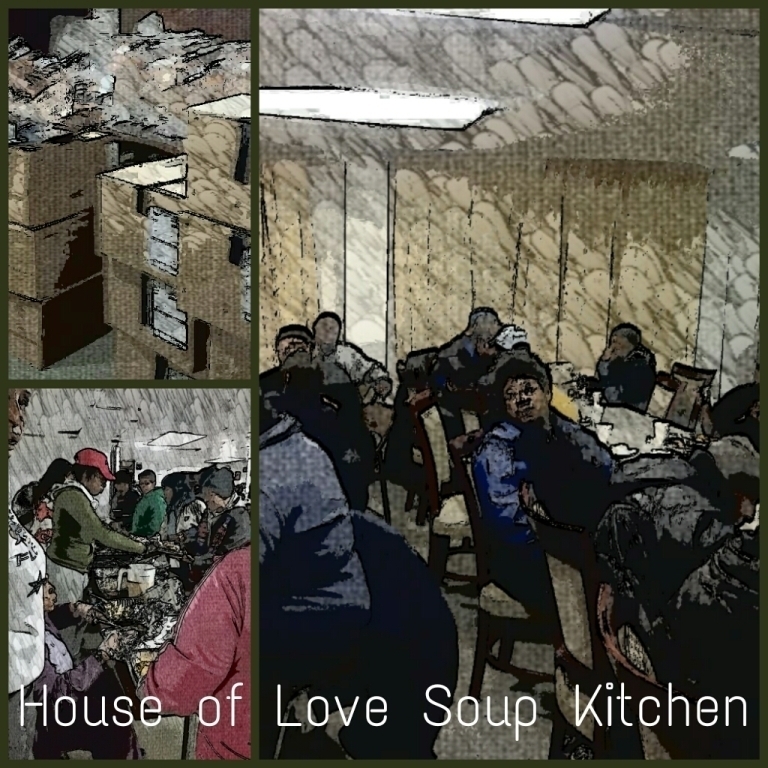 The House of Love soup Kitchen is a faith based organization. The Bible instructs us to take care of the needy...feed the hungry...clothe the naked, visit the sick, see about those who are in prison...set the oppressed free. Who are the oppressed? Those weighed down by desperate financial conditions, the hungry, the homeless, the mentally ill, the sick...all those shackled and burdened by adverse conditions and circumstances. God has given us direct instructions to help people; to love our neighbors as we love ourselves. Does the Trump administration hear GOD's voice? Are they in tune to serving the needs of all Americans regardless of ethnicity and economic status? Or will the seed of greed and power devour them and us? It's prayer time...praying that America will one day truly become "One nation, under God, with liberty and justice for all." 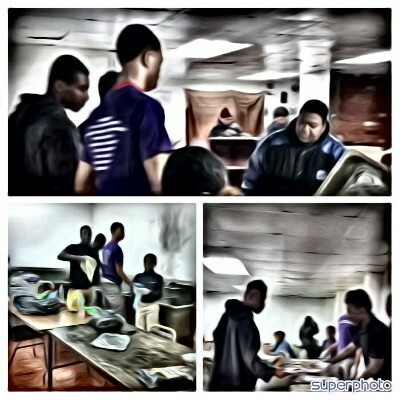 Pantry insanity…early morning hours filled with hustling and bustling…moving fast going to the food bank...Lord give us the strength we need to succeed… Choices of dairy, produce, bread, canned goods all overflowing from boxes of donations given to feed the hungry of America. 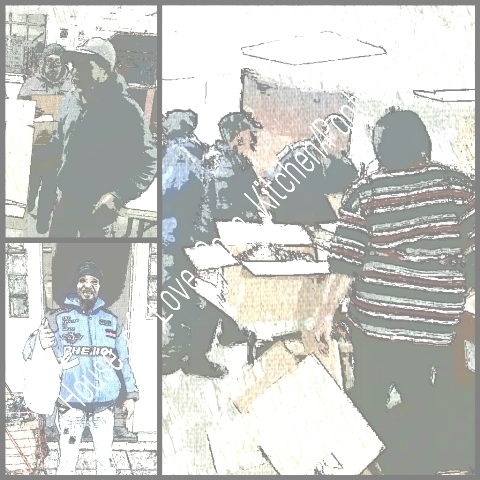 Food bank under staffed…funds cut back…moving slow…weighing in…wrapping up goods on pallets…ordering snacks…checking out…almost two hours behind…finally filling the truck with goods to deliver to people waiting patiently in the cold for food to ward off hunger. The crew traveling into a day to be filled with a combination of highs and lows. Lord give us the strength we need to succeed …Organizing the line…unloading the truck…intake table to set up…paperwork to arrange…goods to be bagged up for allocation…volunteers work quickly…arguments quelled…disgruntled feelings appeased…a pallet with eggs and produce left at the food bank…truck goes back to retrieve…pallet given to another organization...keen disappointment…pantry insanity…clients still grateful though in spite of mishap…60 turkeys given out…enough food items all together to service 85 people from the community…day comes to an end even though people are still coming seeking relief from hunger…hoping for something but all is gone...food scarcity is an overwhelming reality in America..
Join in the fight against hunger in America! Hunger…holiday season on the horizon touching hearts to reach out and embrace love…turkey love…cranberry craziness…sweets insanity...empty stomachs teased…cupboards bare...hearts ache. Hungry people everywhere…poverty across America…no money for the basics…soup kitchens and pantries addressing the need to a degree. That time of year once again has descended upon the economically challenged to emphasize and make them even more aware of this acute condition.